Today, I wore a short-sleeved shirt and left my jacket in the car. I jogged around the park in the sunshine and breathed in the fresh air. I drove with the windows down. 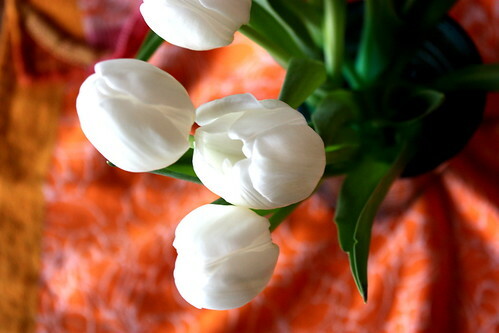 And I came home to fresh tulips and an apartment filled with evening light. I want to believe that it's here for good. I really, truly do. But this time last year, there were those same blue skies and sunny days and then, too, I was skeptical. And for good reason, because come April, there was snow. It was an "I told you so" that no one ever wants to admit. I don't know if it's the Chicago-winter survivor in me or if I'm just an eternal pessimist (or if the two go hand in hand? ), but I'm no stranger to this combination of hope and skepticism. This past weekend, I decided that it's time to start making changes in my diet and lifestyle -- cutting back calories, exercising more, keeping track and being more aware of what I eat. Really this time. It's going to mean a lot of meal planning and cooking lighter foods, eating out less, working out more, and portion control. Once I got started, I realized something: It's really not so bad. Did you know that a cup and a half of homemade soup, paired with a big salad, can go a long way? That if you slow down while you eat, you start to feel just how full you really are? That fruit is delicious? I'm almost embarrassed to admit that I just learned all of this in the past several days, but better late than never, I suppose. No, make that better late than never, most definitely. And then that skepticism starts creeping in, and I start to tell myself that it's still too early to be so hopeful. These are still just the first sunny days, after all, filled with tulips and blue skies and fresh air, and it's all so new and exciting. But what happens if the snow returns? Will I find myself getting tired of the prepping and planning, grasping for motivation and finding nothing but a frozen pizza and a couch? Instead of waiting around for all of that to happen, however, I will remain hopeful. Spring is near, and I'll take every warm day it gives me. I may not be able to control the weather, but I can control how I live this life. 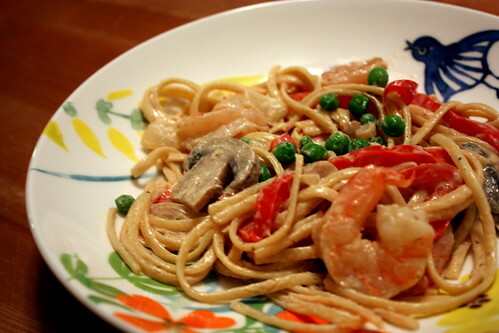 And that means I can have my creamy pasta dish and eat it, too. p.s. Thank you, Jenny, for the motivation and the inspiration. Combine 1 cup water and broth in a Dutch oven or heavy bottomed pot and bring to a boil. Break pasta in half, add to pan and bring mixture to a boil. Cover, reduce heat, and simmer for 8 minutes. Add shrimp to pan. Cover and simmer for 3 minutes or until shrimp are done. Drain and set aside. Melt butter in a large skillet over medium-high heat. Add garlic and onion to pan and cook until onions are translucent. Add mushrooms and red pepper to pan and saute until moisture evaporates. Add flour and Cajun seasoning to pan and sauté 30 seconds. Stir in peas and half-and-half; cook 1 minute or until thick, stirring constantly. Remove from heat. Add shrimp and pasta mixture to pan; toss. Serve with a side of lightly dressed greens. Serving size: 1 1/2 cups. Makes 4 servings. Here's to spring and sunshine and lighter foods and more regular exercise and all of it! like you i have been of the mind to be healthier. this warmer weather thing really does put a spring in one's step, yes? one thing i've done to ensure that i remain motivated with the healthy eatting is my shopping habits. i don't buy any processed foods (frozen or snacks etc) so i am forced to make something fresh. my new job has a very small, limited gym that i will take advantage of. i'm not a work out kinda girl but i think walking the treadmill for 30 minutes is so much better than nothing. and on beautiful days like the ones we're having now, i'm walking around the parking lot snapping pix because at least i'm outside. This is a great plan, but please.... be kind to yourself in the process and if you eat some frozen pizza, or a cheeseburger or anything else that you may think is cause for failure, realize that the next day is a fresh new start and don't look at it as a setback. I lost 25 lbs in the last 1-1/2 yrs, without depriving myself of anything, mostly doing the things you have chosen to do. And here's the thing- it works, but here's something else- we're human and we slip sometimes. No one can be perfect. Engage with your food, slow down and enjoy it and make a few easy rules: eat until your 80% full, then stop and wait a bit. It rarely fails that you want to eat more. And go with the 90/10 rule too, in that 90% of the time you eat great, and allow for 10% of your time to have some indulgence. And yes, move. Dance. Walk. Hike. Box. Use music to motivate. Get some inexpensive hand weights and use them. Got an iPhone? Try the app 'iFitness' to help target certain spots. Or try exercisetv.tv for free tutorials and videos. And above all else, be kind to yourself in the process. It's a process, a lifestyle change. Good luck, and go forth! that looks so very delish - will have to try it. shanna - cheers to all of it! kate - ohhh i love your comment, thank you so much for reminding me that one slip doesn't mean failure! because i know there will be slips, it's inevitable, and i also don't want to give up the foods i love forever. and ohmygosh about the 25 lbs -- good for you!! you are an inspiration. i've been eating more slowly and really focusing on the food, and it's amazing how good it feels to be satisfied with the right amount of food, rather than stuffing my face and feeling, well, stuffed. thank you for advice and encouraging words!